Game of Thrones Season 1 Episode 5: "The Wolf and the Lion"
King Robert: You heard The Hand. Go find the breast plate stretcher. Now! Ned: The breast plate stretcher? King Robert: How long before he figures it out. Ned: Maybe you should have one invented. Ned: You're too fat for your armor. King Robert: Fat? Fat is it? Is that how you speak to your King? 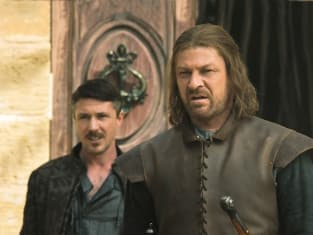 Game of Thrones Round Table: "The Wolf and the Lion"
Game of Thrones Review: "The Wolf and the Lion"